Katherine Boo's Behind the Beautiful Forevers chronicles life in Annawadi, one of Mumbai's slums situated close to the airport and all the five-star hotels that surround it. She follows men and women of different ages, religions, beliefs, and goals to present a very nuanced and complicated story. I said in my review of A Suitable Boy that I loved the book because it showed both the beauty and the corruption that co-exist in India. Boo's book does the same, but focuses on a much lower class of society. While Seth focused on the slow sunset of the Raj's ruling class, Boo tells her story (non-fiction, by the way) by focusing on people that are on the cusp of living in the middle class. They are so close to stability, if only. If only luck goes their way, the government officials don't ask for too much money, the police don't take away their livelihoods, and their neighbors don't turn them in on trumped-up charges born of jealousy and spite. In Annawadi, fortunes derived not just from what people did, or how well they did it, but from the accidents and catastrophes they avoided. A decent life was the train that hadn’t hit you, the slumlord you hadn’t offended, the malaria you hadn’t caught. The very arbitrariness of life is what makes this book so gripping. The crux of the book centers around Zehrunisa, a woman who wants to show that her family has done well in the world by remodeling her home. This is a typical event in most people's lives. But while putting in kitchen shelves, Zehrunisa's crippled neighbor, Fatima, accuses them of ruining her (adjoining) home. The situation escalates, with horrible things said on both sides. The climax is a bizarre turn of events which leaves Fatima with terrible burns all over her body, spewing lies and accusing Zehrunisa's innocent young son of trying to kill her. Zehrunisa's son goes to jail. And as the family attempts to navigate India's complicated legal system, readers are given a truly disturbing glimpse into the many, many levels of corruption that people must deal with every day. I suppose one might consider this book to be a sort of literary Slumdog Millionaire. And I must admit that after reading this book and watching the excellent PBS series Half the Sky, I have come to realize just how prolific prostitution really is, particularly women prostituting themselves in the hopes of gaining some sort of power or favor from someone higher up. I also learned just how often people commit suicide out of hopelessness at their situations, often because they cannot find the money to pay back loan sharks. In all, we are left with a book that gives readers genuine and revelatory insights into the lives of some people who live at the bottom of the urban Indian heap. But as for a cogent, expansive explanation of what put them there, what keeps them there, what occasionally lifts them out of there and the broader trends and events that shape their lives, we are left wanting. I wouldn't say that this book is incomplete by any means. 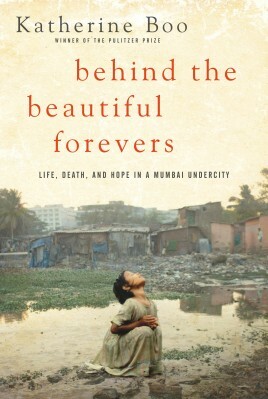 But just as seeing a cell under a microscope does not give you even a hint of the complexity of a human body, or looking at one tile of a mosaic doesn't prepare you for the detail of the masterpiece, this book gives you a wonderfully written, microscopic look at one of Mumbai's overlooked communities. But it doesn't give you the full story. Is it unfair to ask for the full story? Probably. There's so much petty crime, creating an avalanche effect that permeates everything. How can one person grasp all of that in just one book? It's impossible. And so instead, Katherine Boo provides us with stories that detail the impact of this corruption, on the people who have the least opportunity to fight back. And that makes the entire process so much more human and terrifying. I haven't read this particular book, but you make a good point about how books like this, that focus on just a few families or one community, don't usually give a full picture. Yet books that do give a broader view often aren't as engaging because they lack the intimacy that is needed to make the people involved feel like full-bodied people and to make people care about their situation. It's a strength and a weakness all at the same time. Yes, and it isn't fair for me to ask for everything from one author, I know! It was a very well-written book - it wasn't trying to push an agenda or change anything, just detail what things are like right now. It's sad. I'm so glad to see you review this! I've heard tons about this book, but I was a tiny bit wary because sometimes reporters visiting other countries can end up using an off-putting the-glorious-West-versus-the-rest-of-the-world tone in their writing. But it really doesn't sound like that was the case here. Definitely picking this one up. The author mentions this in her afterword. I don't think she came off like that at all during the book, though - she removed herself completely from the narrative and only inserted herself at the end when describing the circumstances of the book. She certainly says negative things about India at that time, but I think they're all warranted. It's a bad system when people who should support each other instead turn on each other. This reminds me a bit of one of the themes that I thought was really well-told in Ship Breaker, which is that you have to be smart AND lucky--just one will rarely cut it. I think that's something that's very missing the traditional American view of class and fortune. I'm curious if this idea of striving for improvement is relatively new in a culture that's historically operated on a caste system, and if that affects how mobility is seen. Yes, one thing I learned in business school is that if good things happen to YOU, you think you deserve them. If they happen to other people, those people are just lucky. If bad things happen to you, then it's outside forces and other people's fault. If bad things happen to other people, it's their own fault. In the US, therefore, most of us think we do well because we work hard, when really we probably just won the birth lottery. In India, that is a different story. I don't know that the caste system keeps people from striving for improvement. It's certainly cause for discrimination, which probably goes hand in hand with mobility. But there's also the Hindu-Muslim-Christian issue which is pretty major, too. I had been wanting to read this since first hearing about it, but didn't make the time for it. What you have said here is intriguing. It's not often that you get peek into this society, but I can understand your frustration at not being able to see the big picture. I am wondering how I would feel about this one, and definitely need to try it for myself. This was a pitch perfect review today, Aarti. I loved it. I am interested to know what you think of this one, too, Heather - I am not sure if you would really enjoy it or if it would make you very upset. But it may be one of those books that upsets you in a GOOD way. I've read the book Half the Sky and until I read it, I didn't realise just how prolific prostitution was, nor how much I have to be grateful for. This book is already on my wishlist. It seems like the author could have broadened her scope a bit to give a more panoramic view? Thank you! And while I complain about her broadening her scope, I do think the book was more powerful for her focusing on just a few people. Oh wow -- this sounds incredible. I don't often read non-fiction but this sounds like one I need to fit in somehow. Your comments about the 'full story' really resonated with me -- in fiction, I expect a complete package -- but I appreciate non-fiction that does show how messy life is -- despite our yearning for comeuppance and happy conclusions. Lovely review. Yes, it's true - nonfiction can't wrap up nearly as neatly as fiction often can, but it does make clear that life can change so quickly on something you were completely unprepared for. I shared Ana's reservations, so I'm doubly glad to hear of your reading experience with this one. Yes, this is a great review! I really need to read this book. I don't read enough nonfiction for this to make it to the top of the list, but it definitely is one that I'm interested in because I went to India as an exchange student way back when in high school. Oh, really? Where did you study? I feel like India is not high on the list of places for study abroad immersion, particularly in high school, so I am impressed! I lived with host families in a small city called Kolhapur south of Mumbai (then Bombay) and attended the local school when the teachers weren't on strike or the school closed for vacations and holidays or I didn't have a trip to go on! It was a backwater back then (1978), but I guess it's a booming place now. I didn't really end up actually attending school much while I was away but it was a great experience! What a beautifully written review. I love what you said about the co-existing beauty and corruption in India and the arbitrary nature of life. I am adding A Suitable Boy and Behind the Beautiful Forevers to my TBR list.